Anyway, where I am quite pleased with the doll clothes I’ve been sewing, I am less than thrilled with my doll shoe attempts. I think where the elusive miniature footwear is concerned, I must admit that I have finally met my match, and defeat is not pretty. Instead, I took to eBay to drown my doll shoe making sorrows in the purchase of a ton of little doll shoes from the free shipping merchants! I know, I know! Proceed with caution all ye who seek to order low priced merchandise on eBay! The first pair of shoes that we ordered was a sparkly pair of ballet flats. I really wanted these because the Little Miss had a pair exactly like them when she was a baby. Too cute! We won these shoes on eBay for $1.30 Cdn. All of the doll shoes that we bought are free shipping, which is nice for us here in Canada where the shipping costs are atrocious. We used to avoid eBay auctions entirely, but now we are more confident with bidding. I was worried about the glitter, that it would come off all over the doll, and get everywhere, but it is very nice. I can’t see it coming off at all. The structure of the shoe is also very sturdy, and the elastic is a nice feature. Ease of use: These little shoes are fantastic. They slide off and on like a breeze, and they stay on. The integrity of the shoe does not collapse when you try to put it on the doll either. I think that little ones would have no problem at all with these shoes. We bought four pairs of the next type of dolls shoes, one in each colour because we just thought that they were so cute! Okay, I have to admit when these first arrived, I was not a fan. They were quite smushed, and I was worried that they wouldn’t go back to their original shape. However, lo and behold, after a bit of time out of the packaging, they bounced right back, and I am quite happy with them now. We paid $2.50 Cdn a pair for these. Here are some close up pics. Again the sole of the shoe is simple craft foam but it is still quite sturdy. It also has a bit of a heel. 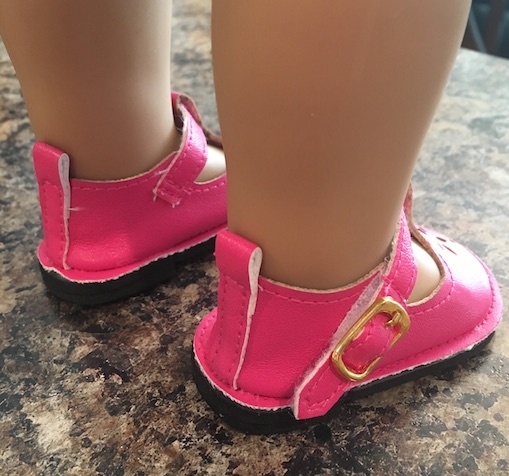 As I mentioned before, the structure of the top of the shoe is not as sturdy, likely why the shoes got squished in transit, but they still go on the doll’s foot easy peasy. No collapsing doll shoe. 🙂 It just slips on like a dream. I only have one minor qualm about these shoes, and that is with the velcro. As you can see where the velcro passes under the buckle it is not attached leaving a gap. It doesn’t really affect the closure, but I prefer if it was attached. I will probably just put a dab of hot glue in there to close the gap. Since the buckle isn’t a functioning part, it shouldn’t deter the closure in any way. The shoes close perfectly. We have other doll shoes with clasps that don’t reach around the doll’s ankles. These are such a dream. There is plenty of room so you don’t even have to stretch the strap. I think that maybe this style of shoe isn’t for everyone though. They seem a bit on the youngish side, so if your doll is a teen or preteen, they probably wouldn’t want to wear shoes like this. But if you just have a desire for a ton of doll shoes like we do, then these are a nice addition to the collection. I have to give these little shoes four stars out of five simply because of the velcro on the clasp, and the fact that they arrived so squished. Also because they might be better suited for the baby dolls than for the little girl dolls. Although I can still see our younger girls wearing them, and they will be appropriate for the historicals as well. Okay, let me explain the awesomeness of these slippers, besides the price which was $2.50 Cdn. First, let me turn them on their side. Do you see the awesomeness yet? Real fabric elastic!! Not transparent rubber elastic bands that just break off right away!! Hooray! Secondly, look how thin that sole is! No longer will our dolls topple right over while wearing their slippers! Instead, these boast a sturdy flat sole that is still fuzzy. 🙂 That’s smiles all around. Look how fuzzy too!! That’s quality fuzz. 🙂 I am so impressed with these, and they fit the dolls perfectly. How cute are they?! I have to give these little slippers five stars hands down for just being so dang adorable as well as durable. I am certain these will stand up to play. And so ends our first round of doll shoe reviews. We will be posting plenty more, so stay tuned! I won’t lie, ordering from halfway around the world has one downfall. It takes plenty of time for things to arrive! At least a month or more, even! But if you have patience like we do, I mean, really we don’t mind waiting for all of the doll shoe cuteness to arrive, when there are sweet deals to be had. I hope that you enjoyed our doll shoe-topia! < Previous JULY IS SO HOT, BUT SEW DOLLY! I am not very familiar with eBay. I usually purchase from China and get good results. However, there have been some duds. It’s not so much the provider, but the product. Most Chinese suppliers on Ebay offer the same products, so stay tuned as I will be doing a full review of some of the better products. 🙂 Then you can just search doll shoes on Ebay and find the items that are better than others. There have been a few items that have just never arrived but Ebay takes care of that. I just request a refund if an item is taking way too long past the delivery estimated date. Ebay then contacts the seller, and they give immediate refund. I hope that helps! We love doll shoes here too. We have SO many shoes, but it never seems to be enough. Doll shoes can add up, but you got some great deals. I know! It’s never enough! I feel like I used to about my own shoes. Now it’s like I have one pair of practical shoes for me, and a hundred pairs for the dolls! LOL! We’ve been buying from the free shipping sellers, too, and for the most part have been extremely pleased. It is a great way to add to the wardrobe and accessory stash. 🙂 I love the shoes. I also am CRAZY for boots. Boots are so cute! I just can’t resist them! The free shipping is a really good deal for us here in Canada. We haven’t had any trouble either. Sometimes something won’t arrive but eBay is good for refunding the money. Very cool to see all of your great finds! I was especially curious about the ones with the glitter on, glad to hear that it doesn’t come off. Yes, we were going to get a pair with sequins on them, but it looked like the edge of the opening of the shoe is lined in that same shiny fabric that Xyra had a problem with. We didn’t want to risk it. Glitter we can handle. Stains on our dolls would be disappointing. Great post! Glad you found some nifty shoes to go along with your wonderful outfits. We have a pair of t-straps and the lining is loose. I couldn’t figure out why the shoes would be lined, but it hit me while reading your post…to guard against dye transfer! Thank you for a great post! Love those shoes!! My dolls have WAY too many though, 3 desk drawers full!!! But I love them too! I’ve bought sandals on ebay and they are adorable too. They might be..white, with a pretty design? Nope ours are blue, pink and purple! 🙂 I will post on them soon! We have so many pink shoes too! We needed more neutral coloured shoes that went with anything. Yeah, I started with those zipper pouches but some of the shoes started getting smooshed plus I kept getting more….! Yeah, I hear you about the smooshing. I try to keep only non-AG shoes in the pouches and re-pack now and then. Yes, could definitely use more neutrals. Although we may be good there now too. The shoe wish list is specialty shoes like you see in the Etsy ads.